Nicole Zules, a graduate of the renowned Parsons School of Design in NYC, and Design Industry Partner, has been serving clients in the realm of decorative painting and artistry in NYC and Long Island, NY; Nashville, TN; Houston and the Dallas-Ft. Worth Metroplex, TX. since 1978. Nicole's family lineage of fine and commercial artists has given rise to a lifetime devotion to create unique, tasteful and quality images and decorative finishes on all wall and furniture surfaces including her own line of contemporary and transitional wall finishes, exceptionally executed ceruse, faux bois (wood graining), convincingly duplicating any and all exotic and common woods, as well as iron work aging, marbleizing, and gold and silver leafing. 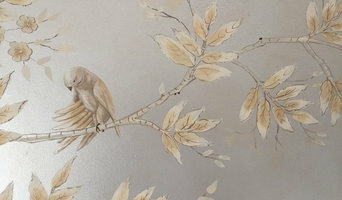 Designated touch-up and repair artist for Robert Turner Associates, Gracie Wallpapers and DeGournay Wallpapers. Ask About Our FREE Color Samples! Our professional painting crews are experienced and well-trained. We only use the highest quality in interior and exterior paint finishes. We will take the time to cover all of your fixtures, such as furniture and flooring throughout the interior of your home or office eliminating the risk of damage or extensive clean up. We take pride in doing a great job not just painting your walls and surfaces, but helping to maintain and beautify your home or office. Making interior design help available for the average home owner is a new program we have recently started! Something as simple as helping you arrange furniture or wall decor, maybe adding or subtracting from what you already have can make a big difference. If you want to change your style, but can't do it all at once, we can help you toget on the right track. We are a decorative paint and faux finish business who has recently integrated decor into our line of work. At Classic Wall Design we are dedicated to helping people create an inviting and beautiful space uniquely suited to each individual. I am available for in home consultations to listen to your wants, needs and ideas and then create a plan with you to make your space perfect for you! Tarrant County Premiere Painting Professionals Best of Houzz 2017! 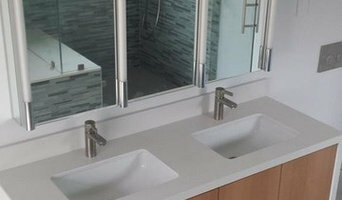 Grace Designs offers a wide variety of of exquisite wall, ceiling, cabinetry, and mirror finishes. Gracie has been creating extraordinary artistic finishes in fine homes over for 10 years. Always on the cutting edge of the most original and premier finishes, if you have an idea, Grace can create it. Modello application, antiquing mirrors, cabinetry, and putting a modern twist on antiques are some of her many specialties. Imported Italian Venetian plaster lines include Firenzecolor, Firmolux, Bel Arte, Vasari, and Stucco Italiano. Domestic lines we use include Faux Effects, Variance, and Texturline. Feel free to reach out to us, we would love to hear from you! We provide painting and staining services to make your house into your home. We can do interior and exterior work along with specialty finishes. We do faux finishes, texturing, repair work and multiple methods of painting. Southern Painting has been offering high quality interior and exterior paint services to the most discriminating customer since 1989. With Southern Painting, you get a team of professionals who provide up front, complete and accurate estimates. We work quickly and carefully and promise to listen and respond to your questions. Our team is dedicated to seeing that the job goes as planned, working to finish on time and on budget. We are bonded and insured, our paint is lead-safe, our work is warrantied and we offer free estimates. We are The Interior and Exterior Painting Experts! 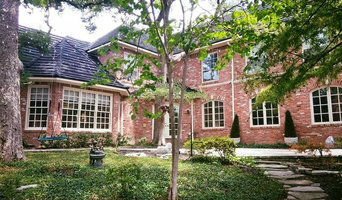 Sandra Gonzalez owner of a A Work of Art is a full service commercial and residential decorative art, mural, painting and remodeling company located in the Dallas / Fort Worth area. Sandra offers a wide variety of custom wall, floor and ceiling decorative finishes. We also specialize in furniture and cabinetry. We are always pushing ourselves to create what is new and cutting edge for today while remaining elegantly classic. Hand painted murals, signs and a world of creative works not confined to flat surfaces!! We specialize in custom hand painted murals & original custom artwork! Professional Artist & Business owner Sheri Johnson-Lopez has been painting murals & selling original artwork for 20 yrs! With a passion for art & homes, That's Flippin' Smart Art can create your perfect masterpiece to turn your project or space into your favorite place to relax or entertain! Faux and decorative finishs for olde world to contemporary, paints and glazes to multi layered plaster finishes. Southern Painting has been offering interior and exterior painting and home improvement contractor services throughout Texas since 1989. Bonded and insured, our paint is lead-safe and our work is warrantied and we offer free estimates. *Authorized 360° Painting Franchisee* Choose 360° Painting of Cedar Hills for your next painting project! When you’re repainting your home or your business, a professional’s touch makes all the difference. That’s why homeowners and business owners across North America rely on the professional painting services offered by 360° Painting of Cedar Hills. 360° Painting of Cedar Hills can help turn your vision for your home or business into a vibrant reality. We deliver eye-catching results on projects of any size and any scope, offering a professional’s touch from the planning stage of your project to the final brushstroke. With an approach founded on quality, responsiveness and customer service, we’re the perfect partner for any painting project. Whether you’re looking to paint a single room or an entire property, Morris Painting Unlimited has you covered. As an established painting service in Frisco, TX, our goal is to provide quality paint jobs that exceed your aesthetic expectations. Every painter on our staff is highly skilled and trained on the most effective painting techniques so that when you call upon us, you can rest assured that your project will go off without a hitch. At Morris Painting Unlimited, we want to help you transform your space, and we want you to come away more than satisfied with the service we provide. When you hire our painters for your upcoming job, you’ll benefit from our: Affordable rates, prompt and reliable service, clean and courteous crew, & flexible and convenient appointments. Don’t struggle to paint your own space when Morris Painting Unlimited’s painters have the tools and expertise to get the job done quickly and efficiently. For more information or to schedule an on-site estimate, call us today. Custom Residential Painting. & Commercial Painting. Small business family own and operated. We provide painting services in the DFW area. Gold Stars Painting is a professional painting company and has been in business since 2012 offering high quality interior and exterior services. Customer satisfaction is our ultimate goal, that is why we don’t require payment or deposits until the job is done and you have fully inspected. Gold Stars painting goes above and beyond to ensure every single client is 100% satisfied. We strive to get the best reviews and we couldn’t do it without our amazing customers.